Happy weekend my people. Not gonna lie I have the biggest migraine I think I've ever had, but I simply refuse to go a moment longer without sharing this recipe with you! Martin and I had our Anniversary this past week, and since I didn't have anything awesome planned, we just tried to do extra little special things every day this week, and having these awesome Red Velvet Cupcakes was one of them. As cheap as it may sound, (especially since I'm a big cook from scratch girl) I really love taking basic cake mixes once in a while and adapting them to be some awesome little cupcake when you're in a rush, or simply wanna make sure its going to come out great every time. Here is just another success story of a white cake mix turned into something exotic and awesome, and it all happens in about a half hour. Yes! This particular batch was made with romantic thoughts in mind, and so would be perfect for any Anniversary, Valentines Day, Birthday etc, but can also be made anytime just because they're pretty and pretty freakin delicious. So go make them. Comprende? Whisk all your cake ingredients together in a bowl till smooth. 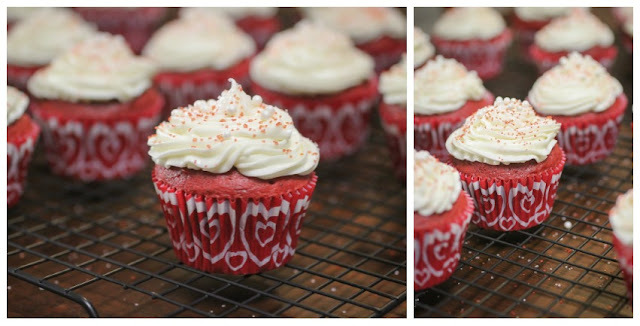 Fill your cupcake liners 2/3 the way full. Bake at allotted time for cupcakes on your mix, but watch the last few minutes to make sure they're just golden browned on the edges when you take them out. Pipe your icing on top once they're cooled and enjoy slightly warm, with milk. Done and done! Another one for the books, because red velvet is appropriate any time of year, and under any circumstance, not to mention the icing which is really perfection and which partners with the chocolaty goodness in the most beautiful way. I hope you give these a try, and as usual I love feedback and would really love to hear what you think and how they turned out! See you back here tomorrow, and have a great day. 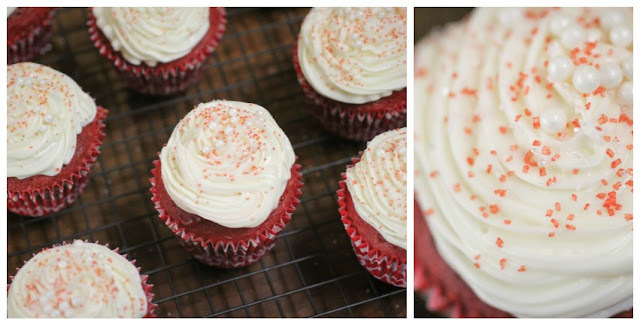 OMG red velvet cupcakes! I drool! I love to eat them not make them though. LOL. Cool tips hehe! 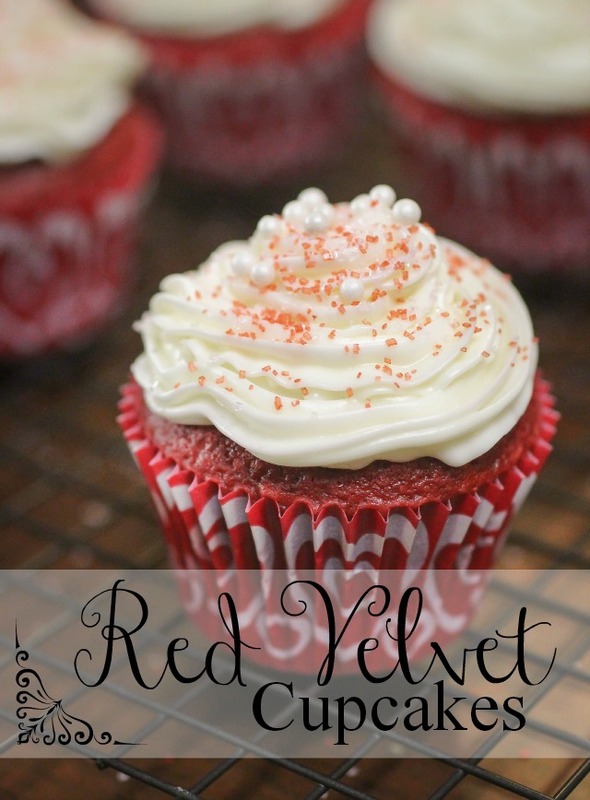 Yum, red velvet is my FAV! Love these! yum! these look so good. I also like using boxed mixes and sprucing them up a bit...it's a great timesaver! These look sooooo good! I'm sorry to hear you have a migraine. I don't know how you were even able to look at your computer screen, but you're super sweet for sharing this recipe despite the circumstances. I hope you're resting now and that it gets better soon! Those cupcakes sound (and look) delicious! And I love all of the yellow decorations! This recipe is a winner, easy, tasty and my family love them. Thanks!